290 pages | 25 B/W Illus. Global Cases in Best and Worst Practice in Crisis and Emergency Management is the first book to focus on select global cases from the perspective of best and worst practices in the context of crisis and emergency management. Bringing together the most established scholars and experts in the field, it offers theories along with an empirical, success-and-failure analysis. It presents the cases using a "lessons learned" approach, highlighting the good, the bad, and the ugly for the benefit of future crisis and emergency management. The book also includes chapter objectives, analysis points, questions, key terms, presentation and lesson exercises, references, and additional reading lists. Policy experts, researchers, practitioners, instructors, and students will find the case studies in this book illuminating. 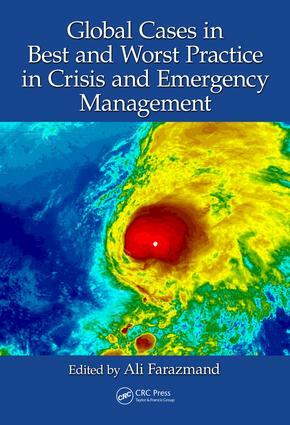 With its combination of theory and practice and coverage of a wide range of disciplines, it provides an ideal primary or companion text for courses in emergency and disaster management, public administration, political science, and global crisis studies. Ali Farazmand is a professor of public administration at Florida Atlantic University, where he is also the director of its Public Ethics Academy and teaches Theory and Philosophy of Public Administration, Organization Theory and Behavior, Organizational Change and Public Management, Bureaucratic Politics, Personnel and Labor Relations, and Leadership Ethics. He received his PhD in public administration from the Maxwell School of Syracuse University. He is the author and editor of 24 books and has written over 150 refereed journal articles and book chapters. He is the founding editor in chief of Public Organization Review: A Global Journal and is also editor in chief of the International Journal of Public Administration and of The Global Encyclopedia of Public Administration, Public Policy, and Governance. He has made groundbreaking contributions to various areas of social sciences and has served as a global consultant on governance and public administration reforms to the United Nations for over 17 years. His recent books include Crisis and Emergency Management: Theory and Practice, Second Edition (CRC/T&F, 2014) and Bureaucracy and Administration, Second Edition (CRC/T&F, 2019). He also has two forthcoming titles, Advances in Crisis and Emergency Management (CRC/T&F) and Public Administration in a Globalized World (Routledge/T&F).